Can we make Taco Friday a thing?? We’ve got the most delicious taco recipe for you to make this weekend with your Strawberry Lime Basil jam (have you heard, strawberry season is almost over so it’s time to stock up)! We cooked jam with pork for a sweet and savory meat and layered on all kinds of fresh toppings including our Taqueria Carrots and the jalapeños we pickled the other day (did you see the blog). Read below to get the deets! Add pork, jam, and broth into a crockpot and cook on low for 8 hours or overnight. Once fully cooked, shred the pork and place back in juices until ready to use. Heat up your tortillas in the oven or on your stovetop. 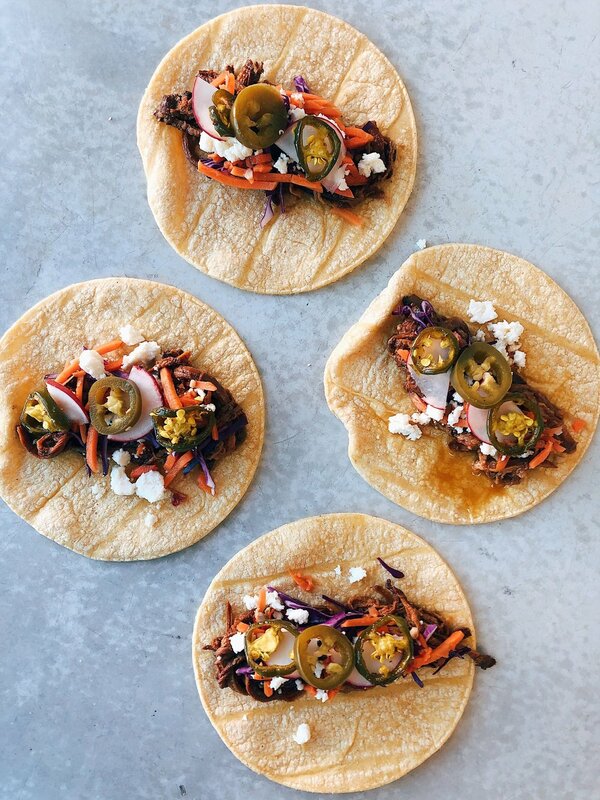 We’re on a real taco kick right now, thanks to the recent launch of our Taqueria Carrots. And nothing completes a taco like a spicy kick from jalapeños! So we’ve come up with TWO pickled jalapeño recipes for you to try. We’ve got a sweet + spicy variety called Cowboy Candy, and a savory + spicy version we’re calling Mexicali Jalapeños! And BONUS, you can make both of these as refrigerator pickles OR canned pickles! Cowboy Candy is a sweet and sour pickle that can be used on SO many things, from tacos to hot dogs to grilled cheese! No one really knows where candied jalapeños get their nickname, but we think it’s probably because cowboys are supposed to be “tough” enough to eat slices of these like candy. Who knows, all we know is that we want to put them on EVERYTHING. 4. While waiting, tightly pack jalapeño slices into each jar. Refrigerate next day. Allow to cure for 2-4 weeks for maximum spice diffusion. Super complimentary to our Taqueria Carrots, we modeled the savory and spicy version after taquerias and taco stands we’ve visited over the years. In this jar of jalapeños you’ll also find carrots, onions, and spices like cumin and oregano! Throw these on your nachos, tacos, avocado toast, or anything you want some heat on! 7.With a damp cloth or paper towel wipe the rim of each jar. We get asked about pickled red onions ALL THE TIME. And you know what? We love ‘em! It’s just not something we’ll be adding to our line up anytime soon. So we wanted to start the new year off with a delicious and easy beginner Sweet + Sour Pickled Onion recipe (adapted from Food in Jars) you can do at home, even if you don’t have a canner! With a hint of heat, a touch of sweet and plenty of vinegar sour, you’re going to keep these stocked in your pantry or fridge. Have we convinced you to pick up a new hobby and get to canning yet? Let’s do it! This recipe is for 1 jar and can be multiplied. Mix all brine ingredients listed above into a non-reactive sauce pan and bring to a boil. While waiting, add spices into each jar. Then take a canning funnel and tightly pack the onions into the jar. Once brine comes to a boil take it off the stove and stir for a minute. Place the canning funnel on your first jar and ladle in brine leaving a 1 inch headspace. (1 inch headspace is the last line of the thread at the neck of the jar). Fill all jars this way. With a damp cloth or paper towel wipe the rim of each jar. Add lids and rings to each jar, closing each finger tight. You don't have to crank it down hard, just snug. Put lid on and process jars for 10 minutes. Place the canning funnel on your first jar and ladle in brine leaving a 1/2 inch headspace. Refrigerate next day. They can be eaten next day, but allow to cure for 2-4 weeks for maximum spice diffusion.